The first is when the sand is pretty firm. Take your most lofted wedge (in this case, I’ve chosen my 60° lob wedge) and pick it clean, taking sand only after you hit the ball. To help pick it clean, I’ve moved the ball about an inch back in my stance and am placing a little more weight on my left side. This helps create a downward blow and ensures that the club bottoms out a little bit earlier than usual so I’m sure to catch the ball first. I stand tall at address and remain so through the shot. When the sand is soft and fluffy, I use a 9-iron and play it like a standard greenside bunker shot. 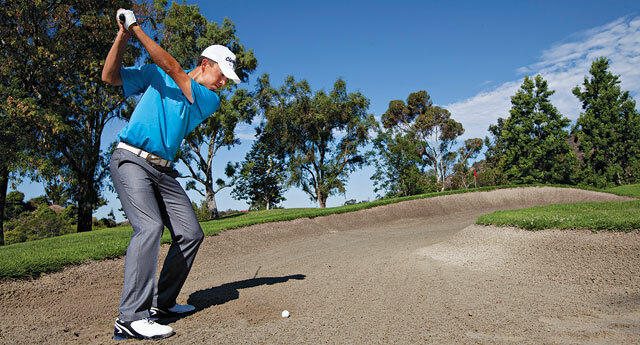 Place the ball a little ahead of your normal position and make a swing that catches some sand before the ball. A nice normal-length swing should do the trick. Like all shots that you aren’t faced with very often, it’s vital to practice both of these options as much as possible. After you master them, you won’t feel as anxious when your ball lands in the kitty litter. The hybrid chip is a shot that should be played when you’re far enough off the green that you need to hit a shot with a little extra “oomph.” If you’re pretty close to the green, I suggest a standard chip shot with either a 7- or 8-iron. Notice how, in these photos, I’m not only about 15 feet off the green, but also below the hole? This is the perfect scenario in which to use a hybrid club, as I need to bump the shot up the hill and over quite a bit of sticky kikuyu grass. To hit this shot, I alter my setup so I stand closer to the ball. (Notice the difference between a normal hybrid shot and the “putting stance” in the photos at far right.) Notice also how I choke down on the club? 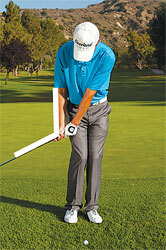 This creates a steeper swing that’s easier to control, much like a putter. I narrow my stance and play the ball slightly back toward my right foot so I make a descending blow into it. This will help pop it up onto the green. Caution: Using a hybrid to chip can yield some pretty “hot” shots. 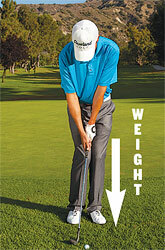 Practice this frequently so you know exactly how hard the ball moves. During this year’s Open Championship, Darren Clarke played many shots with a “Texas wedge.” What’s that? Well, it’s a fancy way of saying a putter hit from off the green. But there isn’t anything fancy to hitting this shot. 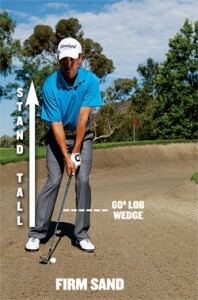 All you have to do is make a few minor adjustments from your regular putting setup. The first and most important ingredient is to stand taller at address (and throughout the shot). 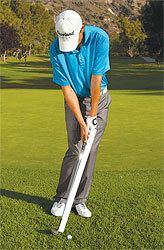 This allows you to make a fuller swing, which you’ll need to help the ball scoot through the longer grass. (Notice how much longer my Texas wedge stroke is in the photos than my regular putting stroke.) The biggest key to pulling off this shot successfully is to know how much harder you have to hit it. There isn’t a specific formula for this, but rather a guesstimate of how much the fairway will slow down your ball. (I don’t suggest hitting this shot from the rough.) As a general rule, I add an extra three feet for every foot of fairway my ball has to cover. So, if I’m 10 feet off the green, I imagine that I have a 30-foot putt. Of course, slope will impact exactly how much harder you have to hit it. To hit a flop shot, simply place about 60% of your weight on your forward foot and use a special double overlap grip (see description at right) to deaden any wrist hinge or extra hand action from your swing. This will help eliminate any extra hand action or “hit” to the shot, so the club can slide underneath the ball and you can utilize its full loft. Definitely try this a few times on the practice green before you put it in play, but by simply adjusting your grip style, you’ll execute the shot without much effort at all. The double overlap grip: Your dominant hand’s pinkie and ring fingers should overlap your weaker hand’s index and middle fingers. Don’t interlock your fingers; just overlap them so about half of your dominant hand covers your weaker one. When you find your ball in thick greenside rough, you want to approach the shot as you would a greenside bunker shot. 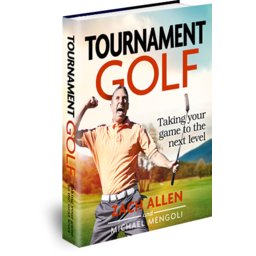 All too often, I see players attempting to hit it like a typical greenside chip: weight toward the target, forward shaft lean and ball back in his or her stance. While this might work for perfect lies, it leads to stubbed chips where the club knifes into the ground and gets stuck, like in the picture at left. Instead, open your clubface and keep your hands even with the ball. This will help return your club to the ball so you use its loft and bounce to cut through the grass, but it doesn’t stick in the turf. Don’t be afraid to take a swipe at it, too. Just as with a bunker shot, you’ll need a little extra muscle, especially if the grass is thick. 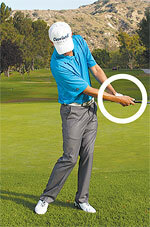 To hit a low chip shot, try changing your standard interlocking or overlapping grip to a 10-finger “baseball” grip. But before you do that, make sure you set up correctly for a slightly downward blow. Place a little more weight on your forward foot and place the ball back in your stance a bit. 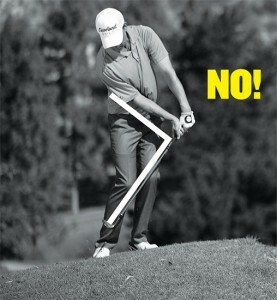 This should produce a forward shaft lean and de-loft the club, which will help keep the ball low. With a 10-finger grip, it’ll be easier to roll your dominant hand over your weaker hand and impart hook spin on the ball. 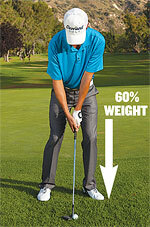 All this contributes to make a shot with a low trajectory and lots of roll. Make sure you try this only when you’ve got plenty of green between you and the flag. 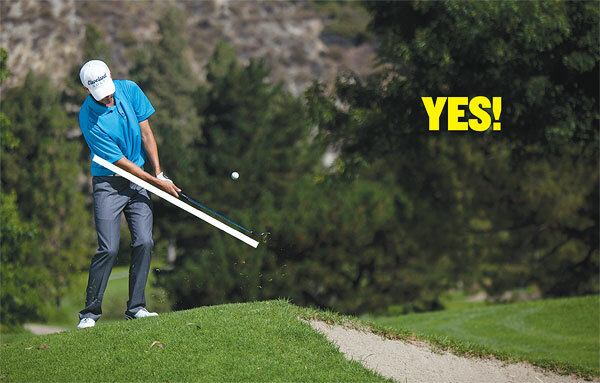 Depending on how high you want the ball to go, you can choose anything between a 6-iron and a sand wedge. Here’s a chip shot that works a little bit like a putt. There are two ways to play it, depending on the shot. Method 1: Use a putting grip on a downhill chip to help soften the blow. This takes out the urge to “hit” the shot. As a result it deadens the shot and limits roll. Method 2: Using your putting grip on a standard chip (demonstrated at right) allows you to stand closer with a more upright shaft angle. 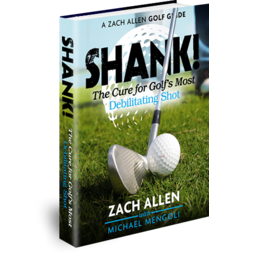 This will help straighten out your stroke, and improve contact. 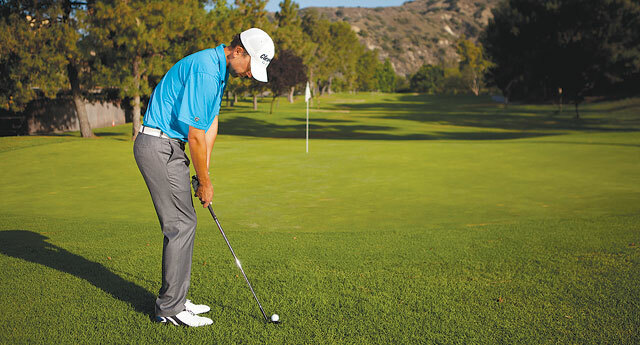 In general, a putting grip puts you in more of a “make” mentality. A question on greenside bunkers. 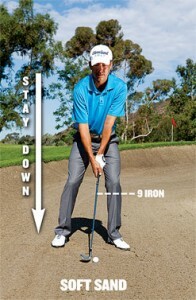 We are told to concentrate on hitting a certain distance behind the ball so the sand takes the ball out. After digging your feet into the sand, with a relatively flat lie, does that not put you below the ball & cause you to hit the sand 1st without being concerned about where you strike the sand? If you were playing from the fairway in the same circumstances, wouldn’t you hit it fat? Thanks.